This has been an all around great experience, from the guides and packers, to the camps and especially the hunt. My awesome moose and beautiful black wolf will make great trophies! I've made great friends and memories of a lifetime! We recommend that you purchase your commercial airline tickets 6 to 9 months in advance. The Anchorage to Port Alsworth portion of your trip will be on Penn Air. When you arrive in Anchorage you will continue on to Port Alsworth as your final destination. There are limited commercial flights from Anchorage to the bush communities. At this time only Lake Clark Air. If you need to overnight in Anchorage, we recommend the best Western Barratt Inn. They're within 5 minutes of the airport, have a courtesy phone in the terminal and a 24-hour free shuttle bus service. The travel agent we encourage all our hunters to use to book travel from home to Port Alsworth and back is Tammi's Uniglobe Travel in Montana. Her Toll Free number is (877) 953-4994. She has hunted with us before, knows the routine and does a great job handling all your travel arrangements….and is a crack shot with a rifle and bow. We can't say enough good things about her. Oh, yes, she's also married! From Anchorage to Port Alsworth, which is a short 1 hour flight across Cook Inlet, you'll take Lake Clark Air at Merrill Field in Anchorage. They do weigh your gear, so plan accordingly. Air taxis allow you 70 pounds of gear, including your rifle and ammo and they will weigh it. Your rifle will travel in a soft case from Port Alsworth to our main camp. Leave your hard case with the air taxi for safe storage until your return. Bring everything on the equipment list and plan for rain. Barring any weather delays out of Port Alsworth, you'll get to our main camp early, which allows you to complete your paperwork and get your license & tags. You then stow your gear aboard the Super Cub and are flown to your spike camp where you can do some scouting for the following morning when your hunt actually begins. Remember your hunt does NOT include any travel days. Please do not bring all your gear in a single "body bag". 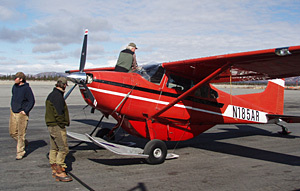 Large duffel bags will not fit in a Super Cub aircraft. Two or three smaller bags will work much better while in the field. If you run into problems with this, pack your smaller bags inside a larger one then we can take them out when you get in the field. You need to make prior arrangements in Port Alsworth to fly your meat to Anchorage where your processor can pick it up. Should you miss your pick-up flight from spike camp to main camp, because of inclement weather, chances are your spouse will be worried. This is understandable but there's absolutely nothing we can do about it. We're located in a remote, rugged wilderness environment and weather is a fact of life. Please do not attempt to call my home. First of all, I'm not there and, secondly, my wife, who is often in main camp with me, cannot help either but only sympathize with you. Being the wife of an outfitter she is used to weather delays. Satellite phone calls from main camp are $30.00 for 5 minutes when the satellite phone is available but usually I have it with me aboard the plane for emergencies. 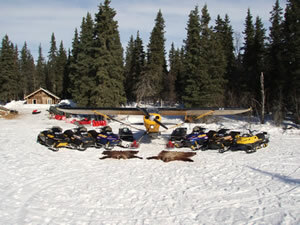 Weather in Alaska is very unpredictable and can complicate any hunting trip. Sometimes it's simply impossible to fly because of high winds, fog, heavy rain, snow or all of the above and in the same day! This may prevent hunters from getting picked up on time by the outfitter or air taxi. You must have a return flight confirmed, which is usually changeable for a fee, should you need to. It's also strongly recommended you make your spouse or contact person(s) back home aware that you could return late and, if so, you'll let them know as soon as you have access to a phone. How do I get my antlers and meat back to Anchorage? From Port Alsworth to Anchorage your meat/trophy will be strapped to a wooden pallet and flown by Lake Clark Air, which is the only cargo carrier from Port Alsworth to Anchorage. They are located adjacent to the Fed Ex hangar. The rate is about $.35 per pound and this is paid in advance (credit cards accepted). There is only one (1) flight a day Tuesday thru Saturday. They DO NOT fly on Sunday and Monday, so plan your return trip accordingly. Once in Anchorage, the meat and trophy is your responsibility to get to a local butcher or pack for your return trip. It's also recommended you bring some old garden hose and duct tape to protect antler tines during shipment, which will probably go air cargo. If you have made prior arrangements with a local butcher he can pick up your meat at Lake Clark Air (with your signed transfer slip) and take it back for processing, wrapping, labeling, freezing and shipping. Below is a very reputable local butcher who will, with prior arrangements, pick up your meat at Lake Clark Air, take it back and process it according to your instructions and ship it to your home. Allow a couple of weeks for this as all meat processors are busy during and right after hunting season. If you plan to take your trophy home to your taxidermist, you must secure a wooden crate because the airlines are not as lenient as before regarding shipping of antlers. And wooden crates have to be specially made. We recommend Dave Dunn Taxidermy in Wasilla. You can reach him at 907-376-9472 or his website. With prior approval, instructions and deposit, he'll meet your Lake Clark Air flight, pick up the hide, cape, antlers, etc. and take them to his shop. When your trophy is ready he'll prepare a shipping crate, take it to the airport (we recommend a trucking company) and ship it to you, or you can pick it up at the airport if you elect to ship it via air cargo. In large parties combining trophy shipments is cheaper if they all are shipped in a single container via motor freight.